I myself, in a single moment, am the Ḍākinī of the Ratna Family, Yellow T’röma, beautified by the signs and marks2, and adorned by the accouterments of the Perfect Resource Body of Awakening3; abiding in the standing position, the right hand holds a jewel, and the left is in the Mudrā of Supreme Generosity, the palm of which is marked by a white OṂ, a red ĀH, and a dark blue HŪṂ. From these a great rain of the ambrosial nectar of immaculate deep wisdom showers down, which issues forth an unceasing flow of offering-clouds, and a splendid wealth of all that is needed and desired, toward the experiential domains of all the guests: The Supreme Gems; those of honor, the Six Families of Defenders of Good Qualities; and those of compassion, the varieties of hindrance makers and Karmic creditors: Meditate thus. 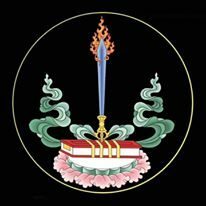 I pay homage to the Tathāgata Many Treasures. I pay homage to the Tathāgata Transcendent Beautiful Form. I pay homage to the Tathāgata Infinitely Expansive Body. And so it was that in response to the earnest request of Sönam Pelden (bsod nams dpal ldan), Düdjompa (Düdjom Lingpa, bdud ‘joms pa) transformed this from the Sky Treasury of Dharmatā (chos nyid nam mkha’i mdzod). Virtue! SARVA MAṆGALAṂ. 2 The signs and marks of Buddhahood. 5 The six classes of living beings.